Few economic issues affect every American as directly as housing. This has been even truer in the wake of the devastating financial and foreclosure crises of 2007 and 2008. Yet housing was seldom discussed during the most recent presidential campaign. As Americans of all political stripes seek to unscramble the unexpected presidential outcome, pundits overlook housing at their peril. Being underwater on a home appears to have been a surprising bellwether for voters, especially in the suburban and rural areas within the Midwest. It was not the only factor, however. Across the board, housing-related factors were well-positioned to play a pivotal role in boosting turnout from voters who were angry and looking for change, as well as in depressing traditional Democratic Party votes in urban areas. Let’s start with the basics. When a homeowner is underwater, or has negative equity, it means they owe more on their home than they can sell it for on today’s market. But the national housing market outlook has continued to improve in recent years, which should mean that homeowners are doing better. 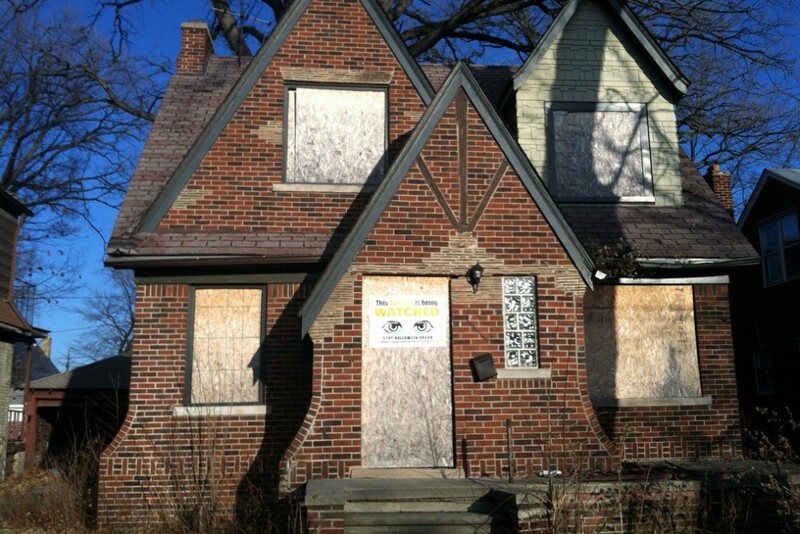 As detailed in the Center for American Progress’ 2015 report, “The Uneven Housing Recovery,” however, millions of families are currently living in distressed urban and rural communities where a recovery has not taken hold, particularly in the Midwest. It is perhaps not surprising, then, that larger proportions of underwater homeowners were prominent features of counties where support for the Republican Party increased from 2012 to 2016, compared with where the Democratic Party gained or maintained a foothold in 2016. 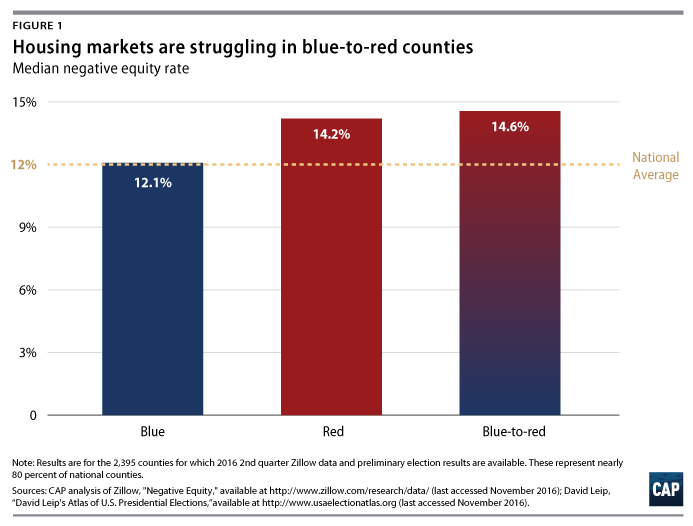 * The flip side of the coin was also true: Counties with strong housing markets—where negative equity rates are low and have decreased—tended to gain more Democratic votes compared with 2012, even in counties where Trump won. Examples of such counties include Kent, Michigan, Waukesha, Wisconsin, and Hamilton, Indiana. While homeownership has traditionally represented the greatest source of wealth for most U.S. households, underwater homeowners in the Midwest have watched their wealth dwindle in recent years. This erosion of housing wealth means that a homeowner cannot draw on home equity to start a small business, send a child to college, handle a family emergency, or move to a more advantageous location. For homeowners, this can result not only in economic harm but also in a feeling that their way of life is slipping away. CAP analysis also shows that, in addition to declines among suburban and rural voters, Democrats experienced shrinking margins of victory in several distressed metropolitan areas. This may have played a role in turning Michigan and Wisconsin from blue to red in this year’s presidential election. * Notably, the analysis found that the Democratic vote was lower in urban counties with poor economic and housing conditions, while it was generally stable in urban counties where these conditions were strong. While smaller Democratic margins cannot be explained by housing alone, the significant challenges facing homeowners and renters in distressed urban counties may have contributed to the weaker Democratic showing. First, just like small towns and rural communities, Midwestern urban areas with negative equity rates higher than the national average played an outsize role in the 2016 presidential election, including Milwaukee, Detroit, and Flint, Michigan. * And while negative equity rates in these metropolitan areas are improving, the progress may not have been enough to build confidence or optimism among homeowners. Second, it may have been more difficult for some low-income renters to vote in this election. In his Milwaukee Area Renter’s Study that took place between 2009 and 2011, Harvard sociologists Matthew Desmond and Tracey Shollenberger found that one in eight Milwaukee renters experienced an eviction or forced move, a circumstance that makes it harder for a household to maintain a permanent address. Wisconsin renters, like those profiled by Desmond, may have faced barriers to voting due to restrictive voter identification laws. Without a permanent address, it is harder for voters to furnish the supporting documentation needed to obtain the ID required to vote. The executive director of the Milwaukee Election Commission noted that some of this election’s largest declines in vote totals occurred within city districts populated with disproportionate numbers of “transient, high poverty” residents. Finally, the mortgage market is effectively broken in many Midwest communities, potentially contributing to some voters’ sense that the housing recovery has left them behind. In 2015, for instance, there were fewer than 600 mortgages originated in Dayton, Ohio. The Dodd-Frank consumer protections did not cause this limited access to credit, as some opponents of financial regulation claim. It’s more likely that lenders have little financial incentive to make small loans in areas with low home values. Companies peddling so-called land installment contracts have stepped in to fill this credit void. These troubling arrangements typically stick a consumer with all the costs of homeownership, including responsibility for maintenance, taxes and insurance, without many of the benefits, including fundamentals such as the deed to the home. In distressed urban, nonmetropolitan, and rural areas, housing instability is causing enormous stress for poor and working class households. Even though it has not received much post-election attention, housing instability may have influenced who turned out for the election and how they voted. Sadly, relief does not appear to be on the way for homeowners and renters in the Midwest. The rumored agenda of the incoming administration, which includes rolling back consumer protections and slashing funding for affordable housing, would inflict more harm in the region. And the president-elect’s likely nominee to the lead the U.S. Department of Housing and Urban Development, Ben Carson, lacks prior experience with housing policy, which may undermine the department’s ability to aid the housing market in the near future. Unless Republicans and Democrats commit to supporting a housing recovery in all parts of the country and sufficient funding for affordable rental housing, more families in the Midwest will be pushed to the brink. * Methodological note: CAP analysis is based on county-level data on negative equity and 2016 presidential election preliminary results. Information on negative equity is available from Zillow (last accessed November 2016). County-level presidential vote data come from the David Leip’s “Atlas of US Presidential Elections” (last accessed November 2016). CAP analysis focuses on the 2,506 counties for which both negative equity and voting data are available. CAP performed a Pearson correlation analysis of negative equity rates and the margin shift toward the Republican Party. The latter was measured by the difference between the margins of votes in 2016 and the margins of votes in 2012. The analysis indicates a statistically significant positive correlation between negative equity rates and a shift toward the GOP compared to 2012 results. Results are available from the authors. Sarah Edelman is the Director of Housing Policy at the Center for American Progress. Michela Zonta is a Senior Policy Analyst for the Housing and Consumer Finance Policy team at the Center. Colin McArthur is Legal Fellow at the Center.